Welcome to the CONVENTIONS MENU page. Below you can read a brief explanations of what content you will find available within each of it’s pull down menu and category button selections. As some of you may know, I have been designing and producing the diorama booths at every USA Celebration convention since 2002. 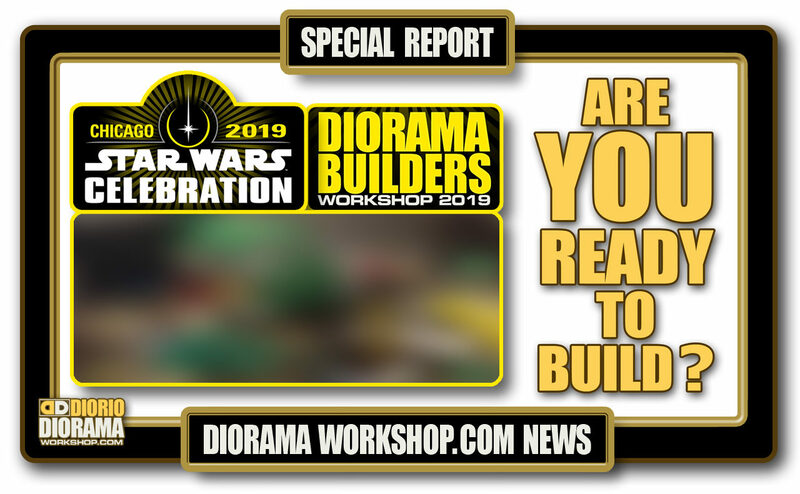 Because of this, it is with great pride that DioramaWorkshop.Com is also the OFFICIAL SITE of the STAR WARS CELEBRATION DIORAMA BUILDERS workshops. 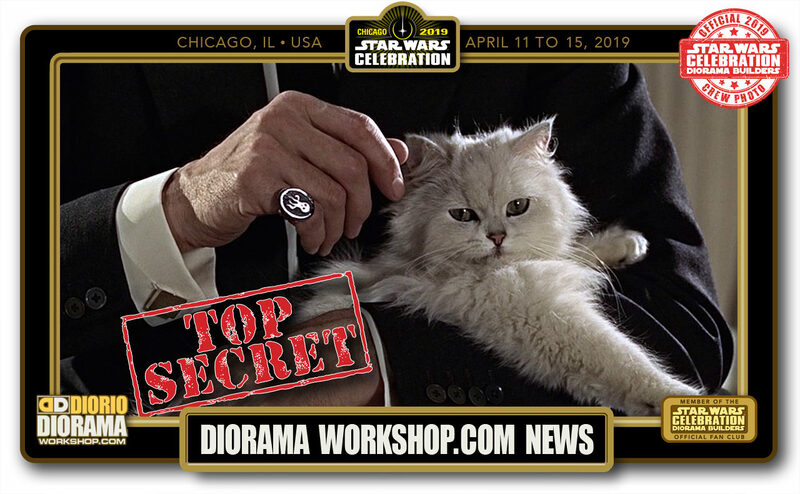 Because of my direct involvement with the conventions, not only will you find my daily photos and videos from the workshop floor (like fans can take when attending to post on their own sites and blogs) but see EXCLUSIVE BEHIND THE SCENES CREW COVERAGE not found anywhere else. Be a fly on my wall starting months before the show even starts as you watch me create concept artwork, designing the choice prototypes leading up to my crew’s on site arrival and booth set up the day before the convention starts. 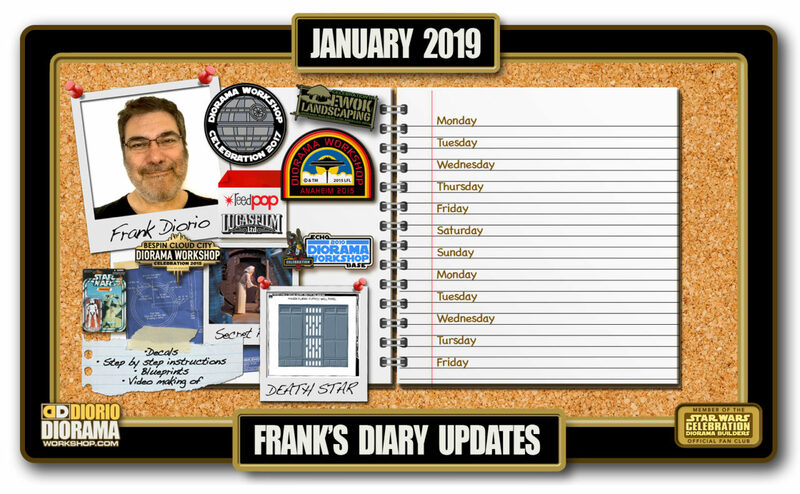 Then the fun starts with Full every day coverage of the builders workshop, including Vlogs (when available) and all that happens behind the scenes where public access is denied. After you look at the photos, you may want to start a build or, if you came and participated in our workshops, continue what you started at the convention. You will find all of the Star Wars Celebration Diorama Builders construction instructions in the Main Menu’s TUTORIAL section. ↑ CELEBRATION II Indianapolis, Indiana 2002. 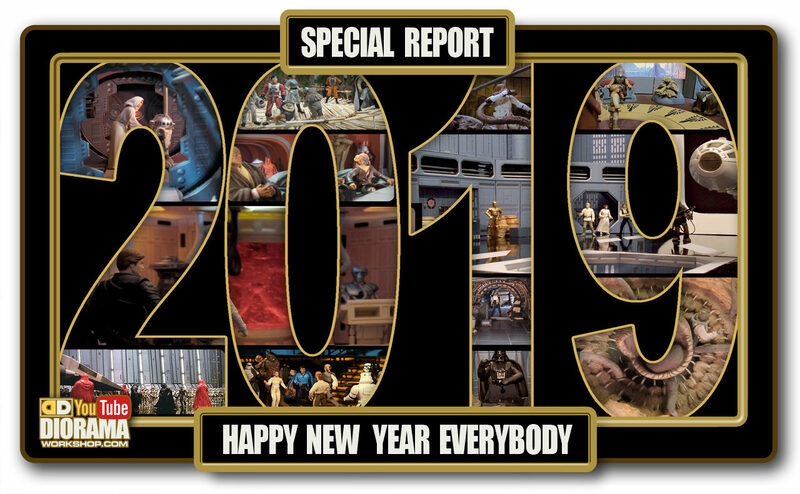 MOS EISLEY DIORAMA BUILDERS … The one that started it all… my first Star Wars Celebration Diorama Builders workshop and what an adventure ever since. You cannot believe what a thrill this was for me as a Star Wars fan to be asked by Mary Franklin to participate and be an actual fan event in a Lucasfilm convention. When I created my first site NiubNiubsUniverse.com in 1999, I thought it would be a great way to share and bring more people into the hobby of making Dioramas. I never imagined being given the opportunity to ever meet all of you guys in person. My great friend Lucie who came with me all the way from Montreal, didn’t understand why people were coming up to me to shake my hand and say how they loved my site and dioramas and to finally meet face to face after years of internet emails and chat room. The expression on her face was priceless. When asked by Mary what I wanted to do for the test run and I thought… “what Group project would best fit with the 25th Anniversary of Star Wars?” Mos Eisley !!! of course ? Plaster houses and paint, “come get dirty with us” was the motto, and we ran out of materials the first day it so exceeded our expectations. Ok I talked enough, time to come see what the fuss was all about. You can click on the image above to bypass the main pull down (side if you use your phone) menu and warp directly to our EXCLUSIVE coverage. ↑ CELEBRATION III Indianapolis, Indiana 2005. IMPERIAL WORKFORCE DIORAMA BUILDERS … After the success of 2002, Lucasfilm called me and asked if I wanted to do it again. DUH ! Did they really think I would say no ? LOL. We got a much bigger floor space, in the MAIN hall this time, not hidden in a banquet room behind closed secret doors 🙂 The plan was to create what could possibly become the greatest Death Star Diorama ever built. Covering a space of 60 feet wide – now that’s BIG 🙂 Each builder would create a room that was stacked (think boxes) side by side and on top of each other to create a gigantic Diorama Wall. As fans arrived, they were greeted by our Life Size Death Star panels, including a giant Blast door booth entrance. Since I was driving again from Montreal, I was able to bring more of my dioramas to exhibit on shelves hung on the wall panels to inspire others to see just what you can do with dioramas and action figures and hopefully recruit new fans to join the hobby. Using foamcore and decals (available in the tutorials section) fans had a blast and we again met a ton of fans and made some great new friends that have since joined the CORE CREW. You can click on the image above to bypass the main pull down (side if you use your phone) menu and warp directly to our EXCLUSIVE coverage. ↑ CELEBRATION IV Los Angeles, California 2007. EWOK LANDSCAPING DIORAMA BUILDERS … This one was VERY SPECIAL and EMOTIONAL for me personally. Not only ws I returning to design and produce another convention workshop, but this was the year my childhood bucket list dream came true. I was hired by Industrial, Light & Magic (ILM) to come work on the very first TRANSFORMERS movie. I was a compositor for Lucasfilm. This time, I was not emailing Mary Franklin the design prototypes and art approvals, I was one elevator ride from her office and would personally go visit her and Steve Sansweet, who was in the next office. It was just the best memories. And the techniques for the trees and hutts worked so well and such a hit with the fans. It just might be my ALL TIME FAVE diorama workshop. You can click on the image above to bypass the main pull down (side if you use your phone) menu and warp directly to our EXCLUSIVE coverage. ↑ CELEBRATION V Orlando, Florida 2010. ECHO BASE DIORAMA BUILDERS … Ahhh the sweet fumes of melting styrofoam LOL. What a blast this workshop was. The CORE TEAM was really starting to gel and become a tight family. The design and generosity of Hasbro donating hundreds of Snowtroopers and Rebel soldiers directly from their china plant, the fact the crew and I had FREE time to leave at closing to go have LOTS of drinks at the hotel pool bar every night, was just THE BEST OF TIMES. This time we divided the diorama build into TWO areas, the Hoth flat surface where the AT-AT’s attack the trenches and on the opposite side of the booth, a true scale version of ECHO BASE including hundreds of feet of snow tunnels and arches. A donated BMF Falcon was the center piece of the base. Kids faces on sunday giveaway was priceless. You can click on the image above to bypass the main pull down (side if you use your phone) menu and warp directly to our EXCLUSIVE coverage. ↑ CELEBRATION VI Orlando, Florida 2012. 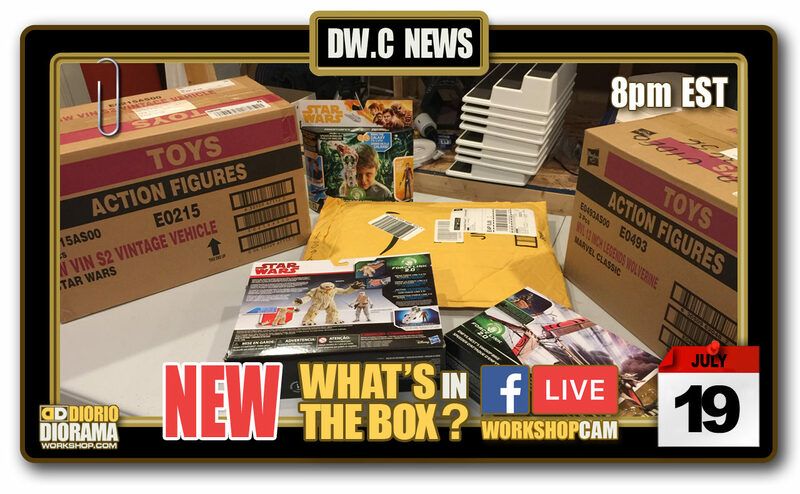 RETURN TO TATOOINE DIORAMA BUILDERS … Our BIGGEST floor space EVER and 10th anniversary workshop. Anthony Daniels, C-3P0 himself even agreed to record catch phrases that would play every 4-5 minutes during the convention. “The odds of burning your fingers with hot glue are 273,000 to 1” 🙂 The best for me was when he agreed to record “Master Frank, it’s so good to have you back once again at Star Wars Celebration” Fans thought we hired a sound alike 😛 Anthony actually is one of the only actors who comes to our booth to see what the kids created each and every time. He truly admires the creativity we bring out of the kids at the shows with simple arts and craft materials and techniques. Since this was year 10, we thought why not go back to the beginning, RETURN to not just Mos Eisley, but the ENTIRE TATOOINE planet. The concept was to have fans start at Episode I and go around the 120 feet of tables all around to end at Return of the Jedi Sail Barge. It was more than we could chew, what is the expression ? eyes bigger than your plate ? We were understaffed for the size of the booth : 120 x 120 feet, 4X every past convention, we had kids steal dozens of donated figures on display, constantly trying to find time to onstruct that cursed Sail Barge AND a Jawa Sandcrawler. There were fantastic fan fave construction choices like moisture vaporators and Sand People hutts but all the troubles made this my least favorite experience and taught us to return to basics for the next adventure. You can click on the image above to bypass the main pull down (side if you use your phone) menu and warp directly to our EXCLUSIVE coverage. ↑ CELEBRATION VII Anaheim, California 2015. BESPIN CLOUD CITY DIORAMA BUILDERS … After all these years of having hasbro donate hundreds of figures to display and give to the kids during sunday tear down, this was the first and only time we officially partnered directly with hasbro side by side. We felt finally, being taken seriously and ask to join the major leagues 🙂 The show turned out to be really tougher then expected in order to flex the well oiled machine to Hasbro’s expectations. The good news is that it was another huge success in the eyes of the fans. Two choices were offered, Outside SKYSCRAPERS or inside HALLWAYS both with multiple options of their own. The end result was huge and very cool. We even got Billy Dee Williams to come and stand with us for the official CREW photo. Now that I have the time, this is one diorama I can’t wait to build myself again for my own home display. You can click on the image above to bypass the main pull down (side if you use your phone) menu and warp directly to our EXCLUSIVE coverage. This diorama was more like making model kits of our youth compared to a action figure “doll house” display. It really brought me back to being 12 again and the fans loved the simplicity of the design and using the tracing templates to create any of the available 14 tile designs. Motorized turretts options for the more advanced builders really brings this to life. I have seen people online use this as wall texture for their collection room, a great idea if you don’t have table space for sure. You can click on the image above to bypass the main pull down (side if you use your phone) menu and warp directly to our EXCLUSIVE coverage. ↑ CELEBRATION IX Chicago, Illinois 2019. The BATTLE OF SCARIF DIORAMA BUILDERS. This year is a NEW partner for us – Still secret for now, until public announce mid-end January 2019, but I can tell you it is a TRUE GAME CHANGER for us and an experience the fans, especially those of you who have come to build with us in years past, one you will never forget. Keep visiting the site and the Diorama Workshop YouTube Channel to watch me prepare for the big show. We have 3 months to go and a ton of things to do, so it will be exciting to go through it all together. The hundreds of photos and videos are grouped into specific category galleries such as designs, prototypes, swag, pre convention set up, day 1, day 2, completed dioramas, sunday kids giveaways, teardown to name a few. Located right below the social share icons, the CATEGORY SELECTION BUTTONS will make your visit easier if you only want to see specific photos. Simply click 1x on a category button to hide all the other photos, click 1x on another category button to make those photos appear on screen instead. If you want to bring back ALL the categories back to the page, just click 2x on any category button.